Villa Blanca is an upscale luxury villa in a premium residential area. Located 3 minutes from high rise hotels and beaches. Villa Blanca is a serene luxury villa with a gorgeous pool and tropical garden. 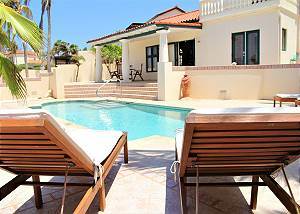 Villa Nirvana is a tropical gem; a romantic caribbean home with a lush tropical garden, huge pool with shallow play area and heated jacuzzi. It has a large outside patio, fun beach area and colorful bar; perfect for larger groups of friends and families. 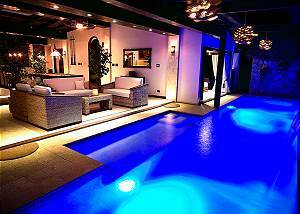 Villa Azul Aruba is a magnificent brand new 5BR/4.5BA Tuscan villa near hotels, beaches, in upscale residential development Opal. Perfect for larger families or friends travelling together. Sleeps 14. Villa Rossana is a unique property because of its location right at the ocean! in the low key fishing town of Savaneta. 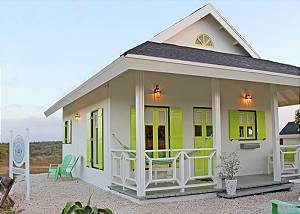 It comes with a huge drive way/parking, sleeps 9, fully air conditioned, private beach and a private pier. 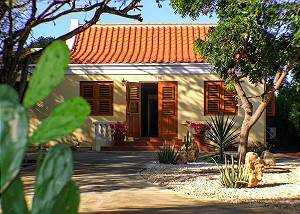 North Shore Cottage Aruba, just 3 minutes by car from the high rise hotel area, beaches of Palm Beach, Boca Catalina, Arashi. Magnificent sunrises and sunsets and lots of privacy. Villa Leila is a spacious 2BR home with pool tucked away on the southern end of the upscale community Tierra del Sol golf club. The beautiful and safe surroundings of Tierra del Sol are the perfect back drop for a wonderful vacation. Villa Marquesa is a luxury 4BR/3.5BA villa, only 5 min to hotels & beaches in the upscale residential development "Sabana Liber Villa Park". This beautiful villa is a serene retreat in an excellent neighborhood with a totally private garden. Tucked away in a private garden lays the most beautiful Aruban "cunucu" style house on the island: Villa Adelaida. This beauty is a romantic hide-away and is so well appointed and charming it is a true gem! Designer bedrooms, 5 star bathrooms and kitchen.